One of the down-sides of feeding birds (for some folks) is the ground mess with which to contend. There are easy ways to avoid waste pretty much altogether… and fairly easily. Whether hanging or pole-mounted, there’s a solution with bird seed trays. 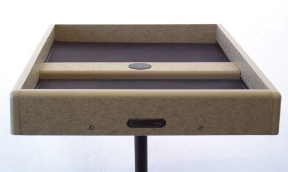 This one is adjustable and accommodates almost any style feeder out there! Although the Seed Hoops hang, they’ll slide nicely right over a pole as well. It’s as simple as cutting a small slit in the center of the tray. 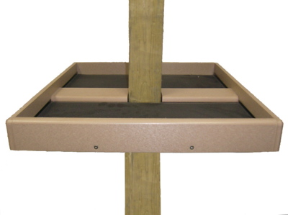 Also in wood and durable recycled plastic, seed trays are available for 4×4 posts too. A tad more sturdy, the poly-lumber (or recycled material) truly does last a lifetime. A few other measures to avoid ground mess or at least reduce its presence, is using a no-waste seed. Because there are no fillers, birds are less likely to sort through and pick out the good stuff! Fillers are what ends up on the ground anyway, millet, milo and corn being most common. Sunflower hearts are always a great choice, and you can bet anything that does land on the ground gets scarfed up quickly. Suet is another alternative for clean feeding. Many birds will partake and there’s no waste. Thistle’s also a good choice as these seeds will not germinate. You won’t see as many species with thistle alone (mostly finches), but when offered along with suet, there should be a good variety. Chickadees, nuthatches, warblers, woodpeckers, and even bluebirds in winter will go for suet. They’ve come a long way since the standard, puny metal or plastic tray. New designs like this Seed Hoop offer much more than a waste-free feeding area. For starters, they’re adjustable and attach to almost any feeder, regardless of its size. 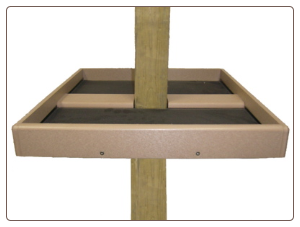 Combined with a huge 30-inch diameter, these bird seed trays catch any and all fallen seed, and so versatile, they can even be pole mounted below a feeder. Sturdy mesh makes them a snap to clean with the hose, light-weight, easy to handle, and no tools required. Also available in a smaller 16-inch diameter, they create a generous platform area that’s like having a second bird feeder. New visitors who’ve never used the feeder, especially during spring migrations, are likely to stop by and grace your yard! In the last few days we’ve been watching a stunning pair of red breasted grosbeaks chowing down on sunflower mix. 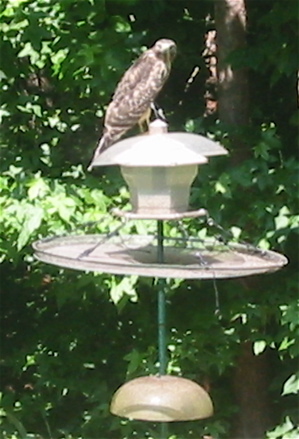 They eat fallen seed on the tray, as well as from the feeder itself. 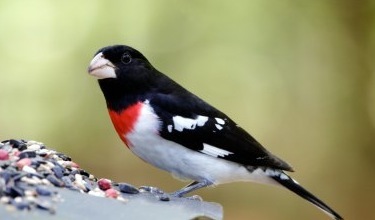 Although grosbeaks have visited in past years, their appearance has always been brief. Maybe these large bird seed trays have enticed them to stick around longer this season? We sure hope so! Couldn’t say how many calls we’ve received about feeders attracting rats to the yard… double yuk! Using a premium “no-waste” seed mix, or sunflower hearts may help to avoid the mess. It’s usually the stuff birds don’t want anyway that ends up o the ground (millet, milo and corn). Plus these fillers tend to attract some less desirable birds like crows, house sparrows and other predatory-type birds. You can still feed the birds and avoid the ground waste using bird seed trays that work. These models are recycled plastic and made for standard one-inch poles or a 4×4 wood posts. 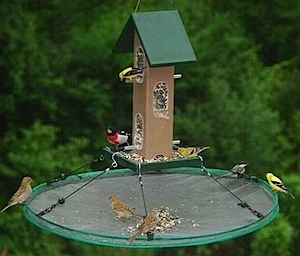 Just place one of these fine babies below your feeder and forget the mess. They may not look so large in the photo – but they are very generously sized! Measuring 23×21, these seed trays are proudly made in the US from plastic containers at landfills. Each comes with a label telling you how many containers were used to manufacture the tray. And that’s all well & good, but these recycled materials also come with lifetime guarantees against warping, cracking, splitting or rotting. Now that’s a beautiful thing! 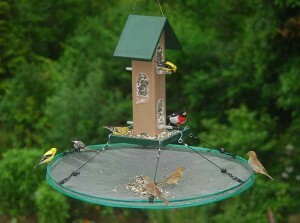 Each seed catcher or bird seed tray has removable screens for easy cleaning. Another cool aspect of using trays like these is new visitors are likely to check it out. The large, flat area containing spilled seed creates a second feeding spot for birds who may never perch at your feeder. Save seed, save money, feed more birds! If you’ve ever seen rats crawling around the ground beneath bird feeders, they’re just looking for a meal, even though it’s enough to make your own skin crawl! Spilled seed is a major attractant of rats and other unwanted guests, in rural and especially in urban areas. The first reaction is usually: “Oh no, I have to stop feeding the birds now.” Not true! There are some fairly simple methods to stopping the madness. One is to use seed catchers or seed trays which prevent spilled seed in the first place. The large platform area of some seed trays will attract new birds who have never used the feeder. 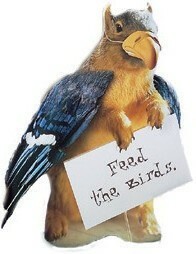 Another way to avoid these unwanted guests while still feeding your birds is to feed a high quality seed. Less expensive seed mixes contain fillers like millet, and finely cracked corn. Birds will continually toss these seeds out in search of the good stuff. So why not just feed the good stuff to start with? Black Oil Sunflower is a great basic seed preferred by many species. An even better choice is the Sunflower Hearts or Meats. There’s absolutely no waste, no shells, no mess. It does cost more, but again… there’s no waste, so it’s almost a wash. Nothing wasted on the ground for scouring rats, opossums, or raccoons, because all of the seed is consumed by your avian amigos! Suet is another good choice because there’s no waste, no mess. Specialty mixes (doughs) are even meant for summer feeding. Some of the more common, or fat-based suet formulas may sour and turn rancid in summer’s extreme temperatures. But the heat will not affect suet doughs…. and both resident and migratory birds devour this stuff! 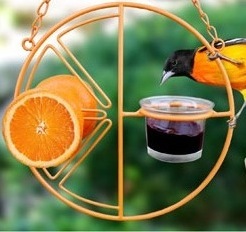 “thanks for chatting with me yesterday about seed catchers for my bird feeders. I am going to hold off on buying and change the birdseed instead to shelled sunflower nuts. I did go look outside and indeed there is a lot of millet on the ground, along with sunflower shells. I’m hoping this will work, if not I will order the seed catchers! By the way, the seed catcher shown above is adjustable. 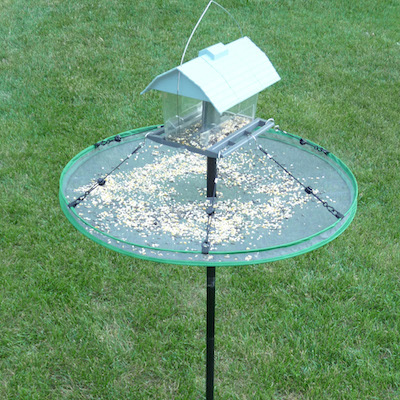 It fits just about any feeder and comes in two diameters; 16 and 30-inch. The larger “SeedHoop” may even be pole mounted by creating a slit in the center of the tray. They’re versatile, durable, and best of all… they work! When spilled birdseed sits on the ground for a few days, it gets nasty. Combine that with some rain and warmer temperatures, (like we’ve been having in the south) and you get insta-mold. That’s my word for quickly-molding, bacteria producing, old seed. Ground feeding birds like some sparrows, juncos and even cardinals will forage through this nasty stuff looking for a decent bite to eat. Thus, bacteria and germs are spread amongst your backyard birds. The result is usually a respiratory infection and many time turns into conjunctivitis. In birds, this disease is usually fatal. 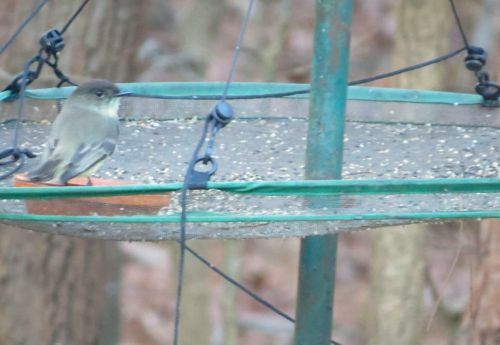 Aside from keeping feeders themselves clean, it’s important to be aware of the entire feeding area, including the ground below your bird feeders. Seed Catchers greatly reduce spilled seed, while keeping the appearance of your yard nicer. 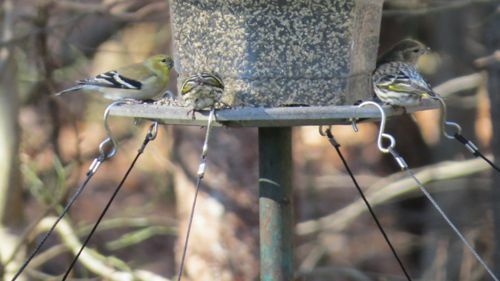 Eliminating the ground mess below feeders really does promote healthier birds. 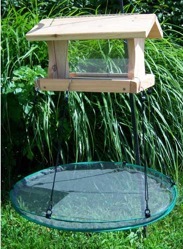 The large seed catcher shown here features an adjustable and innovative design. 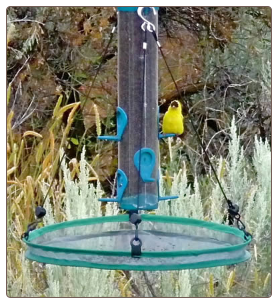 Known as the Seed Hoop, it works virtually with any bird feeder, whether hanging or pole-mounted. Available in a 16-inch diameter, it accommodates most tube-style feeders, even those hung on a shepherd’s hook. The larger 30-inch diameter may actually be pole-mounted below the feeder by cutting a slit in the center of the seed tray. If this is the desired use, it’s best to place some duct tape around the slit, and here’s why: We’ve had the 30-inch seed catcher installed on the pole itself with a finch feeder above. Over several months, this center hole has gotten larger from removing and replacing the tray for cleaning. Besides… duct tape fixes everything, right?